Florida CraftArt is participating with St. Petersburg’s initiative, a national movement “Better Cities for Pets,” as a pet-friendly city. 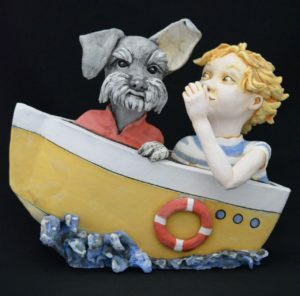 In this call-to-artists exhibition, artworks of “all things pets” will include fine craft artists creations, such as 3D portraits, artful storytelling, and functional items for pets and their humans. Programming will include artists’ demos, workshops, pet meet-and-greets, and partnerships with nonprofit organizations and businesses. 1. Artists are invited to submit recent work. 3. Jurying process: A jury panel will use your digital images to select entries based on originality, creativity, quality and complexity of workmanship, artistry and impact as represented in the images submitted. Cash awards. Opening reception and award announcements: June 7, 2019, 5:30 to 7:30 p.m. Closing reception and People’s Choice Award: August 10, 2019, 5:30 to 7:30 p.m.
For general exhibition information or questions related to the call to artists, contact: Florida CraftArt Gallery manager Liz Rogers at (727) 821-7391 or email Liz@FloridaCraftArt.org. NOTE: Please Download/Save the entry form to your computer, then use the fillable fields and re-save before emailing. Alternatively you can print and mail the completed entry form.